So we were cruising along in this little panga, on our way back from Lovers Beach, and all of a sudden off to our starboard side, about one foot away, this huge whale shoots out of the ocean!! It was so close we were sprayed with whale spit!! You can see that whale spit here on the right side, which is actually the Big Guy’s top side. It’s coming out of his blow hole. Story inside. Picture courtesy of Cabo Trek. 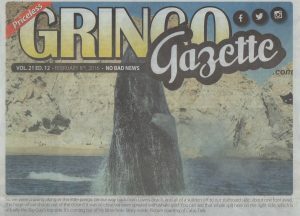 Starting in December a new class of guest started arriving in Cabo San Lucas – Humpback and California Gray Whales, and like the other tourists, they enjoy swimming in the Sea of Cortez. Between January and March it is hard to go out into the sea without seeing one of these grand beasts. Be sure not to miss them as by the end of April they are packed up and heading back home to Alaska. Just what they pack is a mystery to us, but we’re sure they must bring something with them besides the barnacles on their backs. Whales visit us for three reasons. First, they come down to get laid. As they do not have easy access to online dating, whales come here to play the dating scene and try to hook up. “Scuse, it-s always dicey to use the term “hook up” to a fish. Secondly, the female whales come here to safely die birth. After paying down in Cabo the year before, female whales gestate for 11 to 13 month so on their next trip down they are ready to release a new whale into the world. 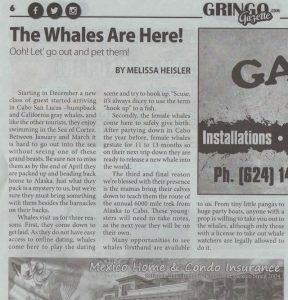 The third and final reason we’re blessed with their presence is the mamas bring their calves wont to teach them the route of the annual 6.000 mile trek form Alaska to Cabo. These youngsters will need to take notes, as the next year they will be on their own. Many opportunities to see whales firsthand are available to us. From tiny little pangas to huge party boats, anyone with a prop is willing to take you out to the whales, although only those with a license to take out whale watchers are legally allowed to do it. Pricing ranges from $120 at the excursion stands you see around town, (or less or even free if you sign up fo a time share presentation but doing that is pretty extreme), to the smaller more personal tours with a guide costing around $90, to a larger more comfy boat and a meal for $49 to $80. You can often go out for as low as $20 dollars if you can talk a water taxi guy into heading a little further out to sea than they usually like to go. Again, it is illegal for those guys to get very close, so you’re paying for and getting a cut rate deal. Most tours last two to two and a half hours. Besides price, see if your tour group has a marine biologist on board for questions and education. And ask how many people you will be sharing the boat with, and if they have a hydrophone to hear the whale’s underwater chatter, that’s fun to eavesdrop on. Also check to see if the company is aware of and recognises the work of the Whale and Dolphin Conservation (WDC) and the World Cetacean Alliance (WCA). These organisations believe whales and dolphins have begun to move away from areas where a lot of boat-based watching occurs and reproduction rates of the whales may be impacted. Or they may not. We are getting record number of whale visitors lately. 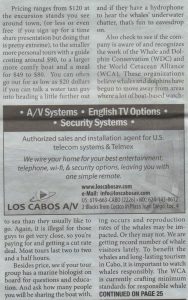 To benefit the whales and long-lasting tourism in Cabo, it is important to watch whales responsibly. The WCA is currently crafting minimum standards for responsible whale watching and plans to offer accreditation in the future. 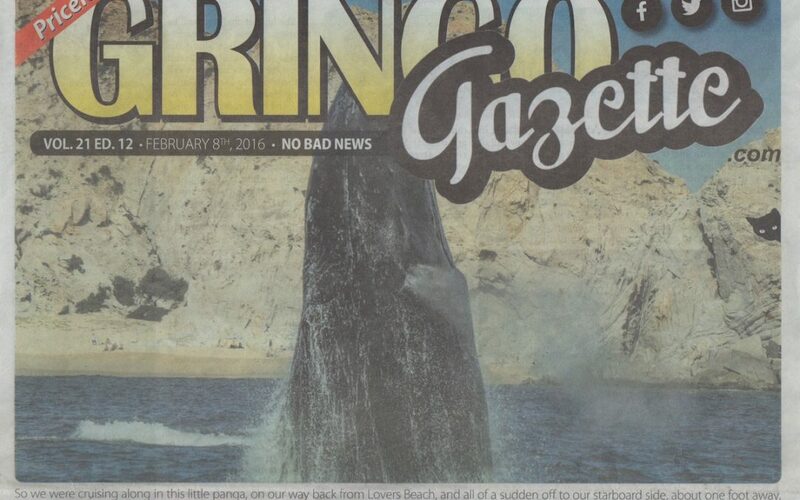 Cabo Trek sends a drone up to spot the whales and take pictures of the hunt. You can buy their pictures at their office in the old lobby of Tesoro in downtown Cabo even if you don’t go on the boat ride. You can buy the pictures to enhance your fake war stories back home. This seems to be just turf building, as there are already non profit organisations in place that do this. Also, Semarnat, a federal ecological agency, licenses all boats that go near whales. To get the license the boat hand must take a 2 hour course on do’s and don’t’s of whale encounters, and pass a test. If you go out whale watching in Cabo you can’t expect to pet them, because here we have the humpback whales who frequently show aggressive behaviours such as breaches, tail slaps, and pectoral fin slaps. Occasionally humpbacks approach the boat but that is very rare and for short time, nothing compared to the gray whales in Lopez Mateos north of here. Those up there are gray whales and the encounter with these animals is very different: in Magdalena bay it is possible to pet them, as they are more mellow, and often come right up to the boat. Cabo Trek is one local whale watching company that takes the safety of their customers and a respect for the whales seriously, even providing a marine biologist onboard. As a World Cetacean Alliance partner, Cabo Trek states they “work diligently towards creating a common consciousness and understanding of the oceans and we strive to make a difference in this world by interacting with it responsibly and humanely”. This tour group ensures they maintain a safe distance from the whales and works to educate their adventurers on ways they can help the whales and other amazing wildlife around Cabo San Lucas. If your decide to take a boat out to see one of these grand mammals, it doesn’t really matter what time of day you go out, as they’re always there. Whales do not have normal sleep schedules like we do. Whenever they need a little downtime, they shut down half of their brain to sleep, counting on the other half of their brain to keep them afloat and be aware of their surroundings. February is the best month to see the new babies with their mothers mostly concentrated in the area between Punta Ballena and Medano Beach. When your are on the boat, don’t even try to take a picture. You’ll spend more time looking at your camera and cursing the missed shot. Enjoy seeing the whales first hand with your own eyes and don’t worry, most tours will offer you shots or videos after your trip. Cabo Trek is the only company that brings a drone along, permitting them to get amazing aerial footage of these creatures, as well as you in the boat. You want to take home a drone shot of you chasing whales? Go to the drone guys. Seeing whales is hit or miss. They don’t take appointments. When small groups of male whales arrive there is more activity so there are some days with more going on than others. Due to the weather or the lack of whales coming out to play, your excursion may com up short. Some tours recommend you book two trips a few days apart to ensure you get your fill of whales. 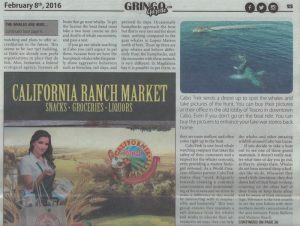 Other companies, like Cabo Trek, guarantee you will see whales. If you don’t they will take you out again for free. If downing some dramamine to survive a potentially rocky boat ride is not your thing, stop by the Cabo Trek office in the Tesoro mall to pick up videos of whales trips taken from their aerial drone. You don’t have to go out, but you still get the evidence you did. Almost as good as the real thing. Their office is in the old lobby of the Tesoro in downtown Cabo. www.cabotrek.com . They also will take you up to Magdalena Bay where you can pet the critters, or they will take you to La Paz to swim with the whale sharks, and they have local snorkel trips. And they have a way cool drone!